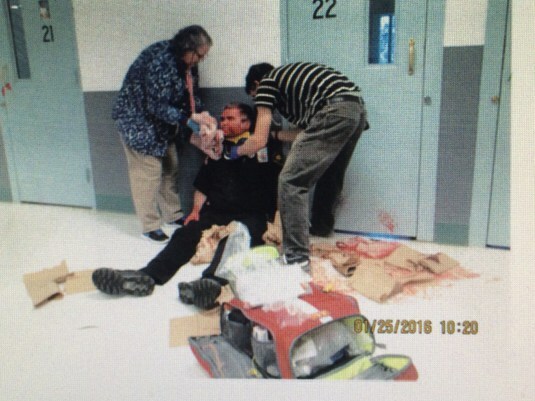 Muslim shouting “Allhu Akbar!” tries to take off correction officer’s head. Officer Terry Breedlove is still hospitalized and experiences difficulty standing. A Clallam Bay Corrections Center officer who suffered serious head injuries last week continued to improve but remained hospitalized Monday. Correctional Officer Terry Breedlove remained at Forks Community Hospital and will remain there until he can walk, according to his family. “He’s going to be here longer, I think,” said Breedlove’s mother, Joanne Spaulding. Breedlove suffered a brain injury during an attack Jan. 25 by inmate Abdinjib Ibraham, 28, of King County, investigators said. An MRI was performed on Breedlove on Saturday. It showed injuries to two vertebrae, Spaulding said. Breedlove can stand but experiences difficulty once standing, she said. The prison, which holds 900 inmates, went on lockdown after the attack and remained on lockdown Monday. Inmates are confined to their cells and there is no visitation. Ibraham said “Allahu akbar” (an Islamic phrase meaning “God is greater”) twice — once when he hit the guard, and again after the attack, said Brian King, chief criminal deputy for the Clallam County Sheriff’s Office.